OK, I admit it. I am in love. 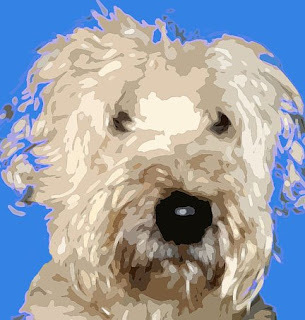 There's nothing like a Soft Coated Wheaten Terrier to lift your spirits. If you don't mind the grooming bills and the forever-a-puppy personality, this is the best friend you'll ever have. A photo of Morley as a puppy appears in a book about Wheatens by Roberta Vesley. His 15 minutes of puppy fame.